Thank You For Taking The Time To Visit Our Website. We Look Forward to Seeing You At the Tables. With a roll of the dice... A spin of the roulette wheel... A chance of hitting 21 or a Royal Flush at the poker table... we bring you the thrill of Las Vegas! It's A Deal Casino, a party full of fun and elegance. 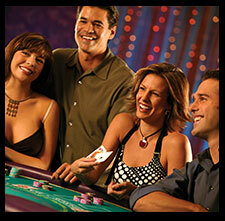 We take great pride in offering only the finest quality casino equipment, services and accessories. Our dealers are professional, friendly, and courteous, plus we include a pit boss to serve all your needs so you can just relax and enjoy your party. We bring the fun and excitement to your event, whether it be at your home, a hotel, school or any venue you may choose. We will make your party the toast of the town and remembered by all your guests for years to come. We are fully licensed and insured, serving all areas of Southern California. Dont know what's involved? Explore our information pages for answers or give us a call. 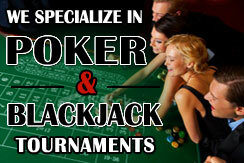 Already know enough about casino parties and need a quote? Request a quote by clicking HERE. We will send you a no hassle, no pressure quote. Looking for a great fundraising idea for your non-profit or charity organization? 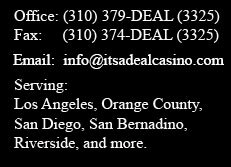 IT'S A DEAL CASINO RENTAL has been providing top quality casino night fundraisers and charity poker tournaments throughout Southern California. Please See our Fundraiser page for more information.